It's not only a thrill having my parrots fly in my yard, it's also great exercise for them! Rather than a small free standing aviary, my entire yard is enclosed so that I could be there together with my parrots. This allows me full use of the yard space with or without the birds and it gives the birds a lot of space to fly. Flying is by far the best form of exercise for a parrot. It not only works their wing muscles, but their entire body! They need to tuck their feet in, steer with their tail, adjust their feathers, user their mind, and of course breath and move blood quickly! It is only during flight that the parrots entire body is working up to its capacity. However, don't expect that just because you put your parrot in a large enclosure that it will just fly. Parrots are generally pretty lazy and won't fly unless they really want to or there is danger. Of course in the wild, necessity is what gets parrots to fly many miles in search of food sources. At home, flight training using positive reinforcement will be the closest simulation to their natural ways while also building a bond with you. Parrot Wizard Training Perches are the best way to get a parrot trained and accustomed to flying at home. 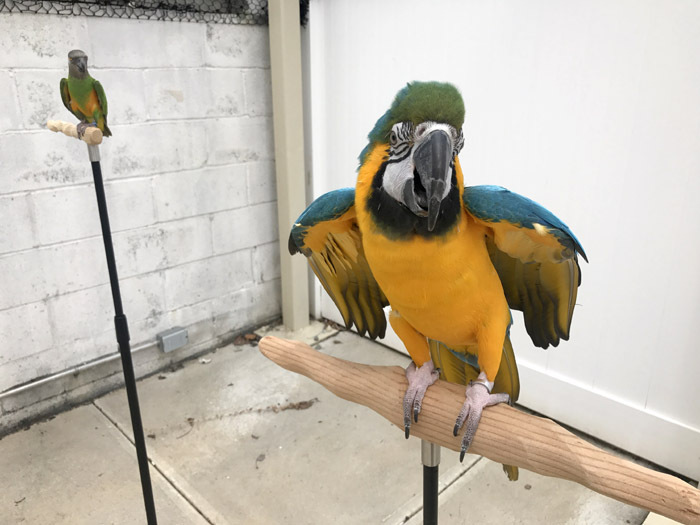 Not only is it necessary to teach the parrot how to fly in a home environment but it is also essential to provide the physical therapy to get their muscles and systems strong enough to be able to fly effortlessly. Then, the commands and methods used to train the parrot to fly indoors can be extended to large indoor spaces such as a gym or outdoors. However, it is imperative to have a back up safety measure when flying a parrot outdoors. 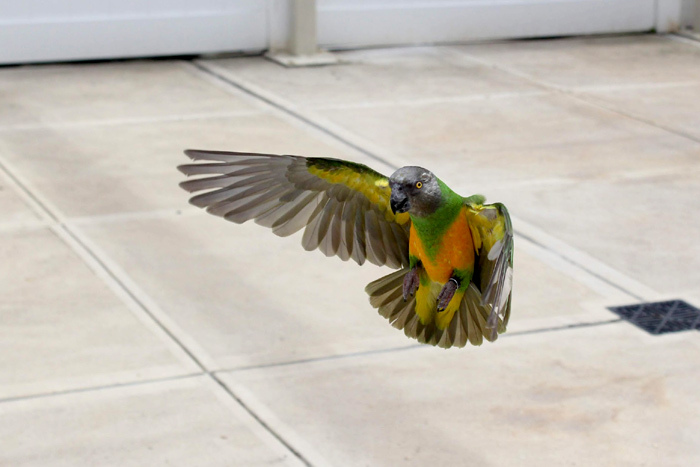 When spooked, even well-trained parrots can fly away. So make sure that you do any outdoor flight in an aviary or with the use of an Aviator Harness as a safety net. Although it may look effortless in the video, it is actually quite difficult to teach parrots to fly on command (especially outdoors). It takes weeks of consistent, and sometimes frustrating, training to get the parrots not only mentally in shape to fly but also physically. After a long winter restricted to indoor flying, it takes a bit of exercise before they can be good at flying longer distances again. Kili and Rachel have been enjoying the fall weather flying in my backyard flight area. They have been building strong flight muscles, breathing fresh air, and getting natural sunlight all at the same time. I'll share details about the enclosure at a different time but simply put it's a netting enclosed area that is safe for supervised time but not for leaving the birds unattended. Truman has been left out of the flight activities lately because of his own issues. He hasn't been too eager to flight recall and on the other hand, he's been randomly flying into stuff. He will need some separate one on one attention to get him on the right track. But since Kili and Rachel are already doing the right stuff, I've been focused on getting them flying. Kili, the trained Senegal Parrot that used to freefly outdoors, had no trouble adjusting to flying in the enclosed yard at all. She immediately knew what to do and did not try to fly away. Kili recalls with great reliability and is definitely my go-to bird. 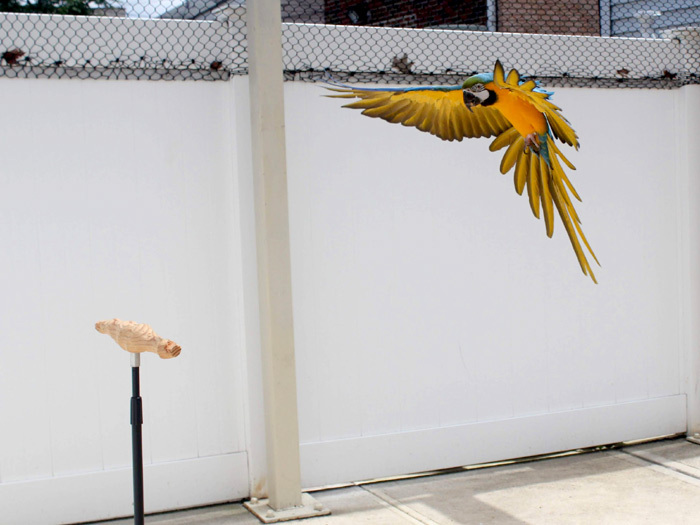 Rachel, the blue and gold macaw, is a bit new to the concept of flying outdoors. She has been out and about wearing an Aviator Harness but really does not have outdoor flight training experience. During the winter, I trained her up to being pretty good at short indoor flight recalls. And you may recall how not too long prior, Marianna trained Rachel to flight recall in the first place. So when brought out to the enclosed yard unrestrained, it was no surprise that Rachel did not know what to do. The way I got Rachel to start flight training outside was to bring her out every day to watch Kili reliably flight training. On one hand, Rachel got to see Kili earning treats and showing what to do. But on the other, Rachel was getting accustomed to the sights and sounds of being out in the yard. It took some time for this to all sink in because Rachel was cautiously reluctant to leave the safety of her Training Perch. Eventually Rachel started to make sure flights, then slightly longer ones. With time and practice, reliability started to improve. It was a combination of building confidence, security, practice, and exercise to improve muscle strength. Now, Rachel makes 10-20ft flight recalls with ease. As the autumn temperatures continue to drop, our chances for further training are quickly diminishing. Over the winter we will continue training other skills indoors and pick up where we left off with the outdoor training in the spring. Here is a 360 degree video of Kili and Rachel flight training in the yard. 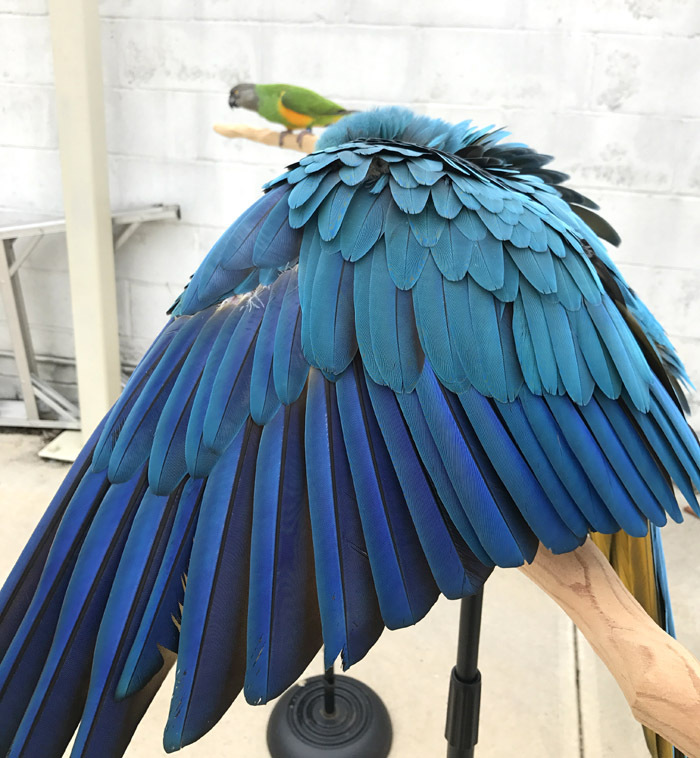 You can move the image 360 degrees by dragging with your mouse or tilting your phone to get a feeling of what it's like having these parrots flying around you. Kili has been a really bad bird so I threw her out the door. Isn't that the best way to solve any parrot behavior problems? Just chuck the parrot outside. It's not like I was going to shoot her for it or something! Bye bye birdie. July 18/19 2015, a game-changing parrot training seminar was held in Russelsheim Germany outside Frankfurt. The seminar was the culmination of nearly a year's worth of online webinar sessions during the scope of which I was teaching training methodology and harness training for parrots of all levels. The Germans accepted us with great hospitality. Bratwursts and pork chops were plentiful. We got to meet many members of the German flight club and their birds during the barbecue the night before the seminar. During the Seminar we alternated between lectures, outdoor flight demonstrations, and feedback sessions for members. Flight club members would show me what they have accomplished with their own parrots and I gave them pointers and feedback on their training. Overall I was very happy to see so much progress and success since we began the webinar series. During intermissions, there were outdoor flight training demonstrations. Most of the parrots flown were on harnesses with long leashes. But a few birds were even free flown. The Germans are convinced that flight and particularly outdoor flight is necessary to maintain a parrot's health. In Germany, they have a particularly bad epidemic of aspergillus in parrots. 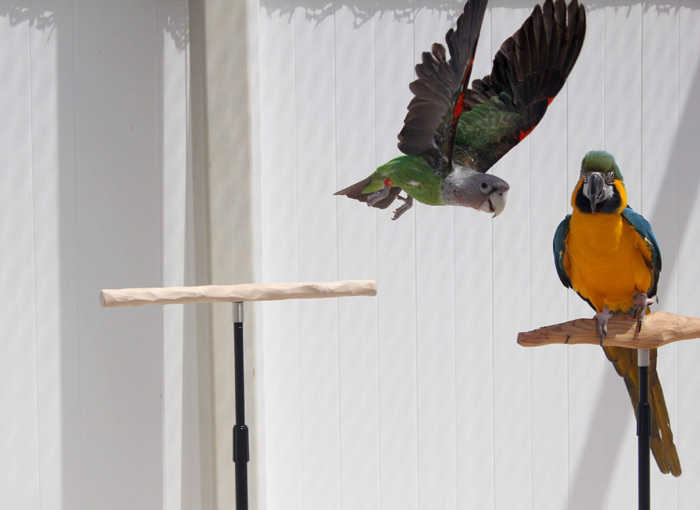 The flight club, with the help of several avian veterinarians, maintains that outdoor flight is the only prevention/cure to the infectious lung disease. More and more people are learning to fly their parrots outside for fun and for health. In the following video you can see some of the flights that were made. They use particularly long flight lines to fly the birds across a soccer field. Some of the flights by more experienced fliers were successful while some of the beginners ran into some trouble. In one case, a pair of blue and gold macaws flew to the end of the line several times in a row. One cockatoo somehow decided to turn around 180 and fly the wrong way. But in all cases of screw ups, the aviator harness prevented the parrots from getting into serious trouble and safely brought them down to the ground in a recoverable place. Further webinars and training will be necessary to improve recall flight reliability. On the Sunday following the seminar, many of the attendees came on a historic parrot outing. Over 20 people and 15 parrots set out by ferry, foot, and by wing to explore the German countryside. A long walk was rewarded with a pleasant lunch at a tavern. Flight club members received matching shirts at their seminar "graduation." They all proudly wore them to the parrot walk. If it wasn't obvious by the parrots on their shoulders, the matching shirts confirmed the group unity. Marianna and I received an honorary induction into their group after lunch. After lunch, a few of us headed to a nearby field to fly some parrots. Florian brought his Harlequin and Blue and Gold Macaw with him. Before we reached the flying location, Saphira the Harlequin Macaw flew off of his shoulder and into a tall tree. Moments later, the Blue and Gold took flight to follow. While the Harlequin is accustomed to freeflight, the Blue and Gold would only sit with a harness. The force of the macaw flying off at full speed coupled with a badly chewed harness, broke the connection and the macaw took off into the tall tree. Florian watched the macaw flying away while I grabbed my camera and caught the moment. The Blue and Gold tried to land on the branch with the Harlequin but somehow scared her out of the tree. Florian did not seem worried. He said this had happened before and he expected the two macaws to come back. After ten minutes of watching and calling passed, I realized the birds were not going to just come back. I said, "we need more birds" and ran back to where the rest of the club was relaxing. I grabbed a few people with macaws and told them to bring their flight lines. The idea was to start flying other parrots (safely) to try to entice the lost parrots to come and join them. Unfortunately the parrots being harness flown weren't particularly enthusiastic about flying and the lost parrots were not eager to come back. Florian kept watching and calling but it was of no use. We watched leaves and branches falling out of the tall tree as the parrots were having the time of their life. An all you can chew parrot play ground is not an easy place to get a lost parrot to come back from. 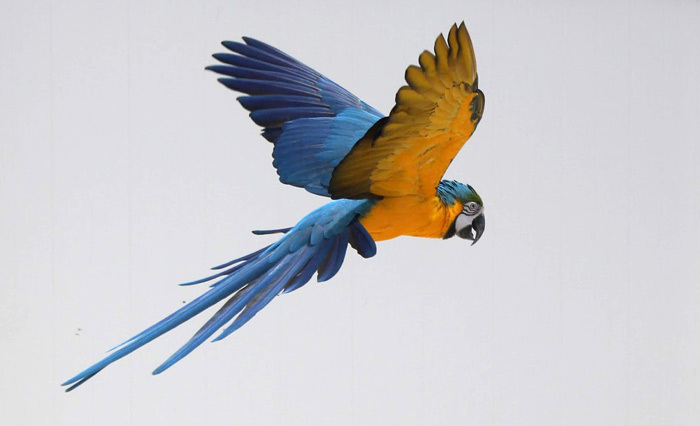 Florian normally used the harnessed Blue and Gold Macaw as a motivator for the freeflight Harlequin to come back. But now that they were both gone, he could not even manage to get the Harlequin to come back. He tried to use treats and Saphira the freeflight capable macaw even came back once for a treat. But no sooner did Florian give the treat that the bird took back off into the tree. The harness did not break for no reason. A new or well maintained harness would not have broken under similar circumstances. Other members of the group had noticed Zazou chewing on his harness and notified Florian. Unfortunately Florian did not accept that the harness was damaged until he stood there holding nothing more than the black end of the leash. An important lesson learned is not to leave parrots with harnesses unattended and to check them for damage prior to every outing. More than an hour later, the Harlequin vacated the tree. First she flew to a shorter tree some distance away. But as Florian kept calling, she finally came to him. Florian hoped that Saphira would help call Zazou back. But it wasn't working. The group had to head back. So we left Florian and a few others to work on getting Zazou back. Some friends brought Florian's RV camper to the site so he could spend the night and continue his efforts in the morning. Did you know that there are wild parrots living in the United States? Since the extinction of the Carolina Parakeet there are no native parrot species to the US. However, there are several populations of feral parrots once brought over as pets. 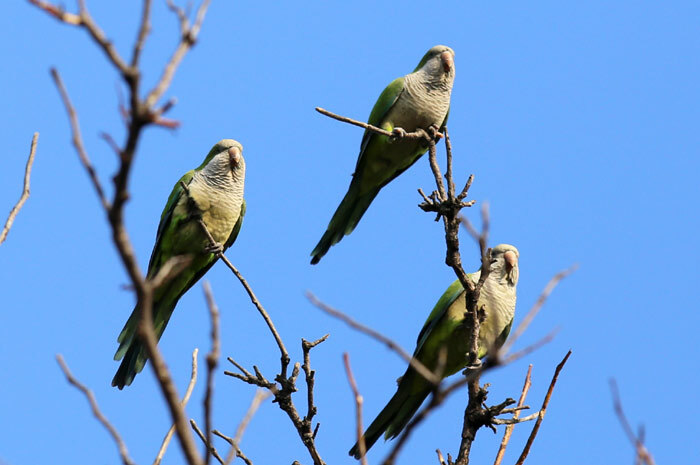 In Brooklyn, New York, there are several populations of feral Monk Parakeets - Myiopsitta monachus - also known as Quaker Parrots. 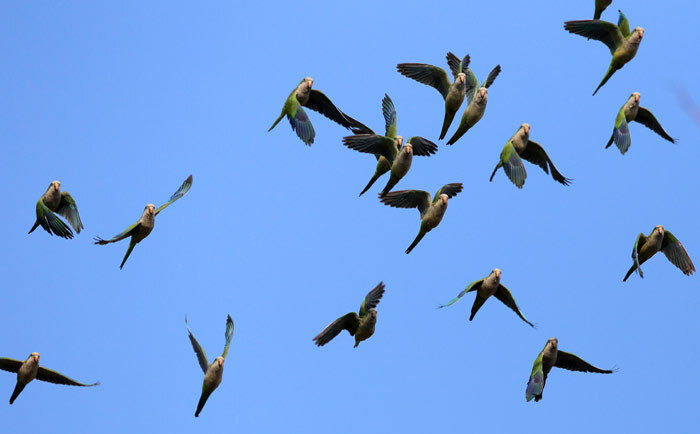 Legend has it that around 1967, a shipment of Monk Parakeets got accidentally released at JFK airport and was the foundation of the urban psittacine population. Lost or released pet quakers may have also joined up with those flocks. Since then, the parrots have bred and multiplied. But life is no walk in the park for these lean green parrots! For a non-migratory tropical bird to survive the cold New York winter's is nearly miraculous. 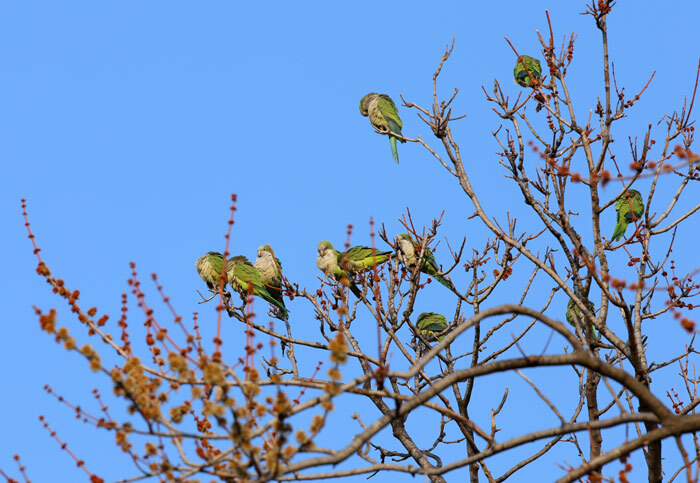 The Monk Parakeets are the only parrot species known to be able to survive these freezing winters because of their instinct to build communal nests. Not only that, they have learned to build these nests on power transformers and make use of a little free heating without paying a bill! The power company despises the destruction caused by these birds but some New York natives stand up for them and ensure they are allowed to survive. I have heard that some city residents try to capture the parakeets to keep as pets. Since they are non-native, I don't think there is any law stopping them. However, bird watchers and fans of the parakeets do their best to stop this perhaps not illegal, but certainly undesirable poaching. 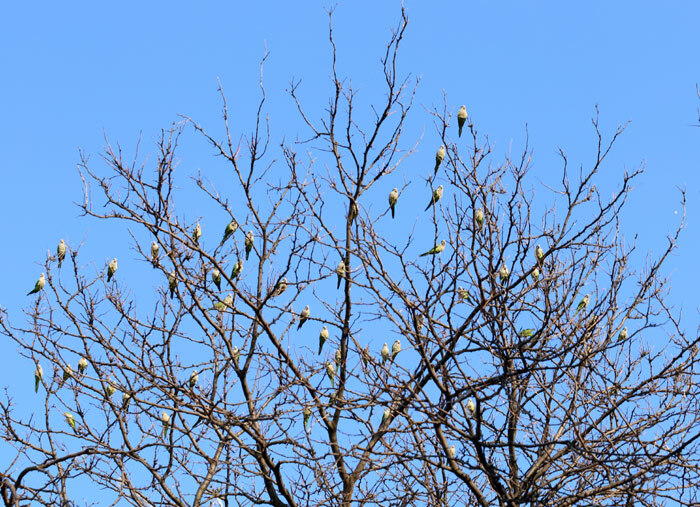 I wanted to see how the parakeets were doing after one of the coldest New York winters I can remember. On a brisk spring day, I headed to one of the locations the parakeets frequent. I was happy to hear their calls and discover that they had made it through the cold. But besides cold and humans, the parrots have yet another enemy to their survival! 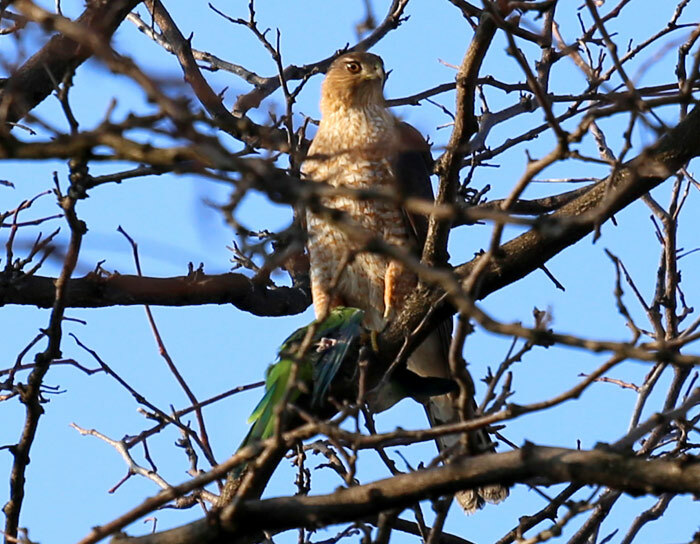 While shooting footage of the Monk Parakeets going about their normal parrot business, we managed to catch a slow motion video of a Cooper's Hawk capturing a Quaker Parrot straight out of a tree! It happened in the blink of an eye, but the green color of the Hawk's victim was unmistakable! As the attack occurred, the rest of the flock scattered in all directions. It took at least ten minutes until any of the other birds had courage to come back to the same tree. The mature Cooper's Hawk flew onto a roof with its catch but later came back to the same tree while still holding its prey. An observation I have made of the hawks that only occasionally visit this city is that they tend to stay in the natural environments (like parks and trees) and avoid excessively urban places. The hawk's red eyes were a firey blaze while the lifeless green bird dangled in its talons. Just another day in New York City. The rest of the flock lives on. The next public "Parrot Safari" will be led by Steve Baldwin on April 4, 2015.